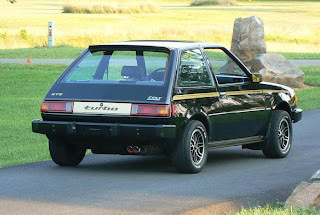 I don't know when the term "pocket rocket" was first used to describe a car, but the first time I heard the term it was in reference to a Colt Turbo. 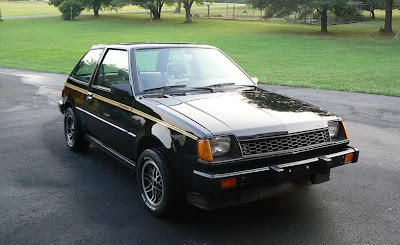 This is one of 200 1984 Colt GTS Turbo Black Editions made. As the seller states, it's a rare car. The 1980s was the era of emission strangled engines. The 1.6 liter engine found in the Colt managed to get the car to 60 in under 10 seconds. While by today's standards that's mediocre at best, back in 1984 that was an impressive time, especially coming from a small hatchback. This engine, like most Japanese engines, takes very well to tuning. With a few engine mods and a higher turbo boost, 6 second 0-60 times are very possible. One of the more interesting things found in this car is the transmission. It is a 4 speed manual, but there is a second shifter that allows you to choose between a high and low range, effectively making this car an 8 speed. The interior is standard Mitsubishi. 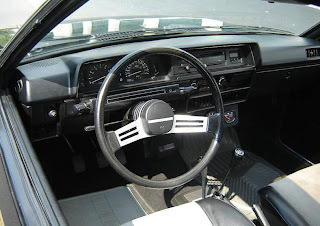 The seats are exclusive to the Turbo and this one has a few extra gauges, but other than that it's what you'd find in any Plymouth Colt / Mitsubishi Mirage. Back in the late 80s / early 90s I got to drive one of these a bunch of times. A friend of mine was looking for a good used car and we spotted one of these on a used car lot. We took it for a test drive. She drove it for 15 miles or so and then I drove it for another 15 miles. I, even more than the salesperson, talked her into buying it. Over the next few years when we'd go somewhere I would talk her into taking her car and letting me drive. It was a ton of fun to drive. (Even with my friend yelling "Slow down, you'll get us killed" from the passenger seat.) It had a lot of turbo lag and a lot of torque steer, but that all added to its charm. This is a two owner car. It is stock. While not 100% perfect, it's a very, very, nice driver. Everything is as it was back in 1984. Considering that many, many hot hatches from the 80s and 90s have fallen into the hands of kids and "enthusiasts" who butcher them, that's a huge selling point in my eyes. This is the point where I often write something like "This is one of the nicest ones I've seen in a very long time". In this case it is the only one I've seen in a very long time. I can't imagine there are many nicer than this one. Click here to see the eBay listing for this car (which has a bunch of good, clear photos). Sweet Car!! I had one when I was a teenager in High School! Wish I had kept it! I had one as well, the black GTS as shown. If I had known only 200 of the black were made, I'd have held onto it.